Two goals from Darren McQueen denied Panjab FA a famous victory over England C in a historic football match on May 28, 2017. Darren McQueen struck twice as England C defeated a spirited Panjab side 2-1 at Damson Park, Solihull, on May 28, 2017. The landmark event marks the first time that a south Asian national team has faced an England representative side. Panjab began the game brightly, much to the delight of the nearly 1500 watching supporters. Players in blue and yellow were showcasing every bit of their determination and self-belief to everyone in attendance. England C struggled to keep any meaningful possession when faced with Panjab’s perfectly timed sliding challenges and high pressing. Gurjit Singh fired an effort just over, before coming just as close several minutes later. After Rajpal Virk released Gurjit down the left, he saw an initial effort blocked, but the ball fell kindly for the Panjab, and Rushall Olympics, striker. He then cut inside with a clever shimmy and curled a shot over the crossbar. With Panjab arguably on top at this point, England C looked to have won a penalty. The Chester FC striker, James Alabi, went round Ash Malhotra in the Panjab goal before going down. But the referee was unmoved and, instead, booked Alabi for simulation. Panjab’s rhythm, though, was disrupted in the 27th minute. Their influential captain, Amarvir Sandhu, went down after a late challenge, and worryingly stayed down as the referee waved play on. The Darlington defender, David Ferguson, broke down the left before crossing deep to Alabi who headed back across goal only for an unmarked Darren McQueen to head straight at Malhotra. Sandhu’s injury meant he could take no further part in the historic game. Panjab manager, Reuben Hazell, sent on Camen Singh Bhandal to replace their skipper. Just minutes later it got worse for Panjab as McQueen made no mistake in converting his chance this time. Alabi’s weighted through ball allowed McQueen to race clear of the Panjab defence. The Ebbsfleet United forward then delicately chipped the ball over the onrushing Panjab goalkeeper with just enough pace to take it over the line before Jhai Dhillon could get to it. Ten minutes after the half-time break, Raj Virk was brought down by Ryan Croasdale in a dangerous central position 25 yards out. Gurjit Singh’s free kick was parried away by the England goalkeeper, James Montgomery, only for it to fall back to Virk who lashed it into the net via the post. After a fantastic run by McQueen, who was a constant menace to the Panjab defence, his low cross looked destined to be turned in by Alabi. But his control let him down and allowed Panjab to scramble away. England C didn’t have to wait much longer to regain the lead as McQueen put the Non-League Three Lions back ahead in the 62nd minute. Ferguson’s low driven cross was met by the England striker and the ball ended up in the corner after taking a deflection off Dhillon. Panjab pushed forward for the remainder of the game in an effort to equalise for a second time. But they struggled to fashion any clear opportunities against a side who were now content with sitting back and playing on the counter. 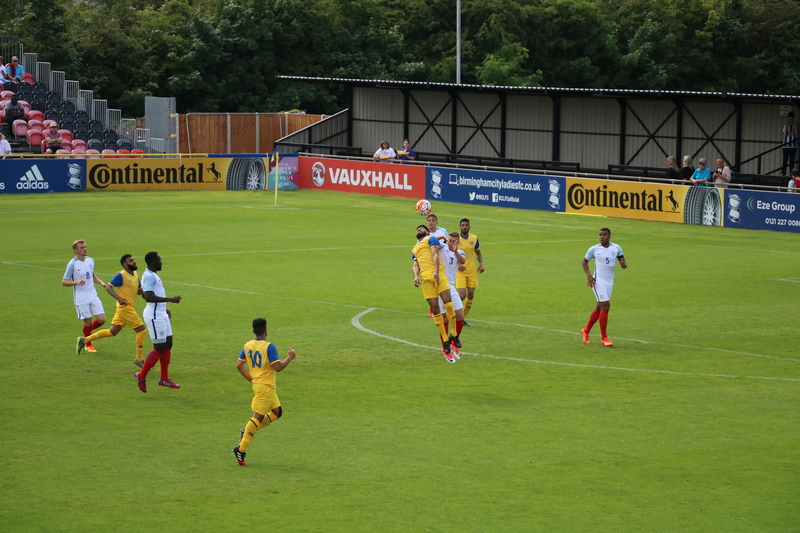 In the final minutes, England C captain, Keaton Wood, did brilliantly to head Gurjit Singh’s cross off the line. And moments later, substitute, Joe Ironside, fired into the side netting from a tight angle after a quick counter-attack. Both teams received warm applause from a satisfied crowd as they went down the tunnel after the full-time whistle. After all, today was always about more than just the football or the result. Panjab FA have shown that they, and Asian footballers as a whole, can compete at a high competitive level, and this match could well be the start of a new footballing era.